Diversity and Inclusion has been a hot topic at the corporate and educational levels for a few years as academic findings conclude that diverse teams have more potential because their members bring disparate knowledge, experiences and points of view. However, many diverse teams do not perform up to this potential because they are not effectively supported to overcome the difficulty of working in heterogeneous teams. In order to reap the fruits of diversity, organizations are required to go beyond hiring a diverse workforce and need to implement proper inclusion mechanisms that foster cohesion. 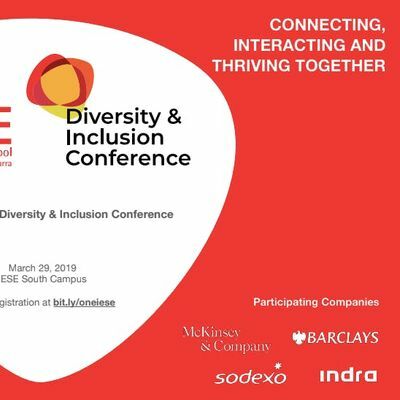 For the first time, IESE Diversity & Inclusion Conference is organized to help bring to light some of the issues related to diversity, inclusion and bias that are still prevalent in companies and academic institutions. The conference brings together champions of diversity and inclusion from all walks of life and opening the floor for honest and critical discourse about today’s state of affairs. It aims to offer participants a better understanding of what corporations and individuals are doing to foster environments that are more diverse and inclusive, as well as how they can challenge the status quo as current or future leaders of their respective organizations.